*It is so wonderful to start the morning with a walk as the weather turns to sunnier and warmer days. *There was excitement at KHS this afternoon as about ten North Idaho College employees came to Kellogg High School to help our seniors who are attending NIC create their fall schedule. I loved seeing their faces as they came and shared their schedules with me. I think for some it made it all the more real that they would be attending college soon. I cannot sing the praises of NIC and their staff enough as they have helped our seniors through the admissions and financial aid process this year. *Paul and I headed to Walmart this evening to pick up some items I need for school tomorrow. 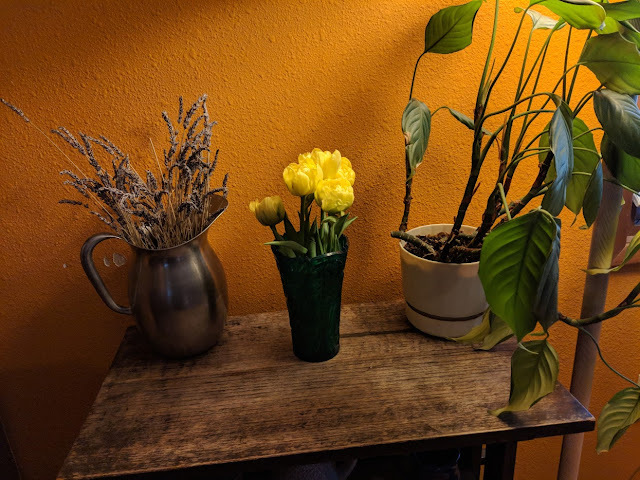 I also spotted some cheery yellow tulips while we were there, and decided to buy a bunch to bring home to brighten up a spot in our living room. *While we were out, we also dropped off the city bill at City Hall, the water bill, and stopped in and chatted with Christy and Everett first, to see their home as it is before they begin demolition tomorrow to make some big changes. Then we went next door and visited with Bill and Debbie. Then we stopped at Yoke’s and picked up some steaks for Paul to BBQ for dinner. I steamed some broccoli, and we had a delicious dinner.